Growing up, picking out the Christmas Tree and decorating it, was a whole thing. We loved it. 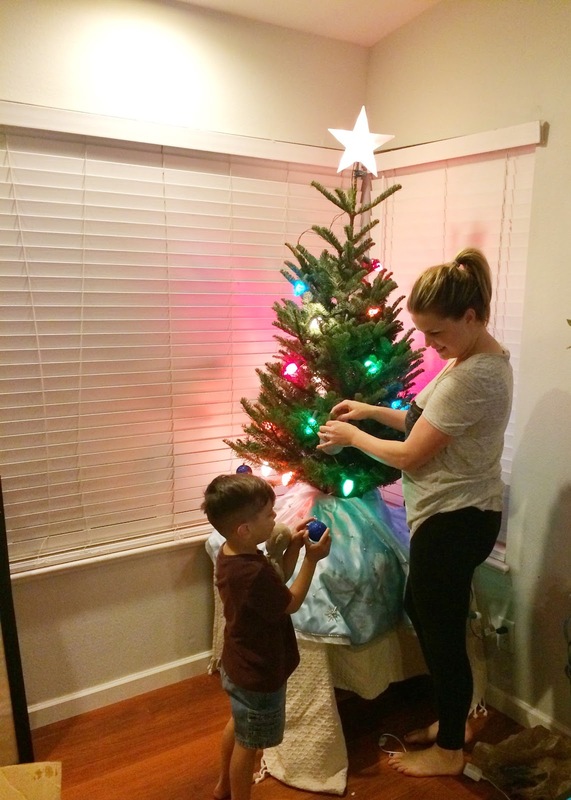 It welcomed the holiday season like nothing else; but ever since I've been married, decorating the tree was a one-man, or woman job. Nathan loves having a tree and is always excited about getting one, but he prefers to buy it, set it up and then sit back. This year, though, I had a tree decorating partner, Hudson. He was a great fun a decorate with. He loved picking the ornaments and placing them on the tree, yes they were all around the base, but I took care of the top. We decided to get a small tree this year and put it up on a table since Jayde is mobile and we don't want her grabbing at it and eating needles and all that. I quite like our little tree. I of course sipped my egg nogg as I decorated it which is something I have done doing since I was a little girl. Hudson even tried it, and he liked it. The tradition lives on. I'm glad you started this tradition with Hudson so He can have happy memories of decorating the tree.